This week’s minorities in cartoons entry is Tom Hale, a Marvel character. Tom’s one of Marvel’s older characters, despite going unused for decades. Tom first appeared (unnamed) in “Patsy Walker” #1 (1946). I couldn’t find any exact creator credits, but I’m pretty sure the credits under Tom’s Marvel Wiki entry aren’t correct. Stan Goldberg, better known as a longtime Archie artist, only worked on Patsy’s comic in the 60s. “Patsy Walker” was originally a long-running Golden and Silver Age comic starring Patsy, a teenage girl. 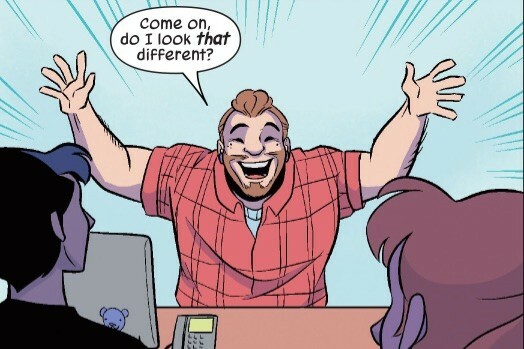 It went through several genres, but was largely about Patsy and her friends’ Archie-like teen romance/humor adventures in their small town of Centerville. Tom was one of Patsy’s childhood friends; his childhood nickname “Tubs” came from his being heavyset. Tom dated his fellow classmate Nancy “Nan” Brown. Marvel and DC both used to publish lots of comics in various genres, before dropping them all in favor of their near-exclusive superhero focus by the Silver or Bronze Age. The fates of these other characters have been to either leave them in limbo (such as DC’s Archie-like “Binky“) or integrate them somehow into their superhero universes. For instance, Congo Bill, a Golden Age jungle explorer, became “Congorilla” by the Silver Age. Fellow Golden Age adventure character Zatara became the father of JLA member Zatanna. As such, Tom, Patsy, and their friends became integrated into the Marvel Universe. Patsy first appeared in the main Marvel Universe in a 1965 “Fantastic Four” annual (the wedding of Mr. Fantastic and the Invisible Woman). Tom himself first appeared in the modern Marvel Universe in “Marvel Fanfare” #89 (October 1991). It’s revealed he’d married Nan, with the couple having two children. Tom had stayed in Centerville, working at a soda shop. Tom Hale. Art by Brittney Williams. Patsy received a new series, “Patsy Walker, AKA Hellcat!” in December 2015. Tom appears in this series as a supporting character, and still Patsy’s friend. It’s assumed that after the events above (if they’re still canonical), Tom and Nan divorced. Subsequently, Tom moved to New York, and came out as an openly gay man. 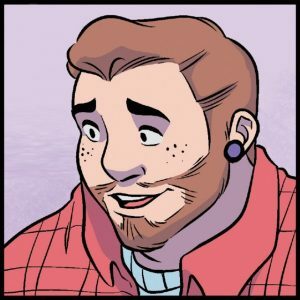 Tom runs an LGBT bookstore, “Burly Books,” which sells popular reprints of the original “Patsy Walker” comics. Tom’s friendly and outgoing. He also enjoys karaoke, as seen when the gang go to a club. Early in the new “Patsy Walker” series, Tom met Patsy’s roommate, Ian Soo. Ian’s an Inhuman with telekinetic powers. Tom soon hired Ian to help at the bookstore; the two are later shown dating.